Being the best is awesome but staying the best is a whole different story altogether! Now, we wouldn’t dare to call ourselves ‘the best’ yet, but it’s certainly what we’re aiming for: to provide the best proposal software for your e-commerce platform. And since we have high goals we know that we have to embrace change. We want to stand on our toes, always ready to move quick and implement improvements when and where we can. So, shortly after launching Propoza we decided that it was time to already make some essentials even better; client contact and layout. Especially when you are into B2B e-commerce, client contact is key for your business. Propoza helps you to create and handle online quotes from your webstore’s backend, so part of that client contact is improved already! Research shows that offering online quotes helps your B2B website to generate more leads and enables you to convert quotes into sales, with a simple mouseclick! Yet we are eager to make client contact easier, sharper and better. So whether you use Magento, Prestashop or WooCommerce, it’s now easier for your customers to give you all the information you need to make the best quote! Form Building* – We have created a number of optional fields that you can now enable or disable. Do you want you customer to only fill out his name? Or do you need his phone number, street address, zip code, email address, company name et cetera? With our new form builder1 you control which fields you want to appear where. Get all the information you need beforehand and make communication with you customer easier! 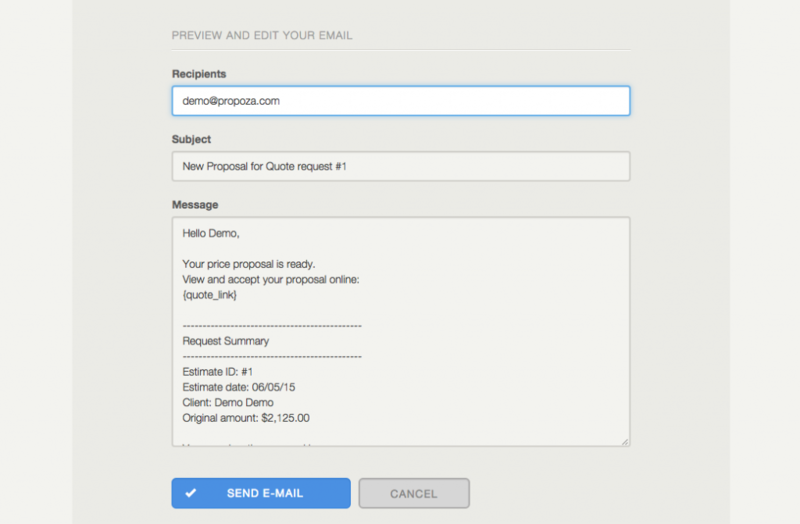 Email Messaging – Don’t just send a price. With our new email messaging2 service you can now send friendly, personal messages with your online price proposal. Your website might be business to business, it’s still a person you’re communicating with, so you might as well add a personal touch to your quotes. The good news is that it’s still done from the same backend so it’s not more work, it’s just more personal and, we think, more professional! Reason Declined – We all know it happens. Not every shot is a goal, not every proposal is converted into an order. Yet! Because with our new feature3 you can now ask your customer the reason why he said no. Maybe you overlooked something small and you can still score the order with a minor change! Or maybe you consistently get the same message; ‘too expensive’, ‘delivery too late’, ‘not the right service’… This will give you some insight to maybe make changes to the way you do business altogether! 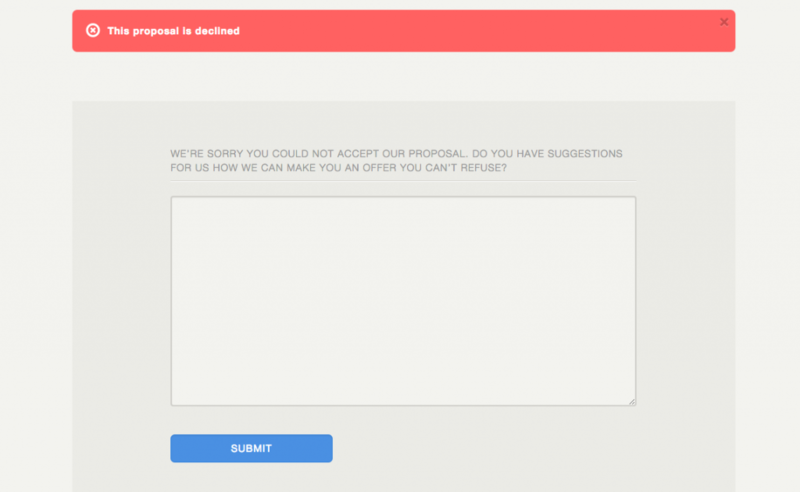 Anyway, it’s really easy for your customers to add the reason they declined your online proposal and enables you to stay in contact and have a second chance! 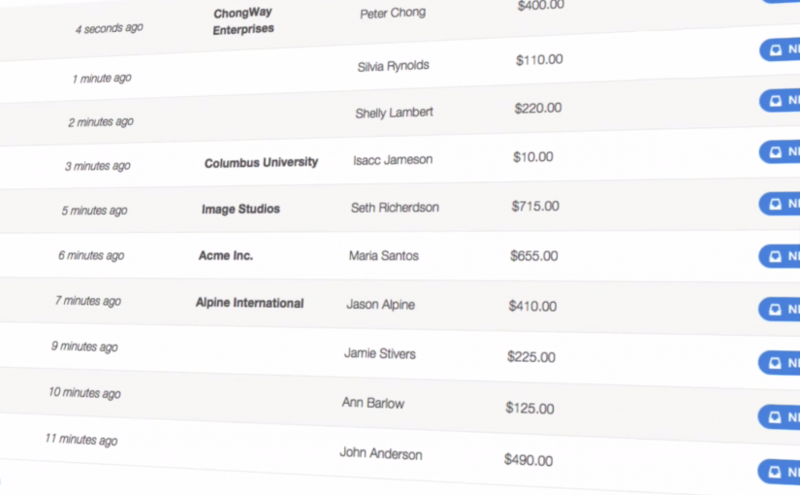 We hope and trust that these new features will enable you to do business online better. Again, we believe that enabling your clients to ask for and receive quotes online will really improve your website, your client contact and eventually your business! Start enjoying the new features and visit your Merchant Dashboard today! Or Testdrive Propoza and visit the demo. * To use the new formbuilder in Propoza you will need to update your e-commerce platform Propoza extension. The updates can be downloaded via the Merchant Dashboard or via your E-Commerce platform extension/package manager.